Whisk buttermilk and yolks in large bowl. Whisk flour, sugar, baking powder, baking soda and salt in medium bowl. Whisk flower mixture into buttermilk mixture. Beat whites in medium bowl until stiff, but not dry. Fold whites into batter. Pour about 1/2 cup batter on skillet that has been heated and brushed with butter. 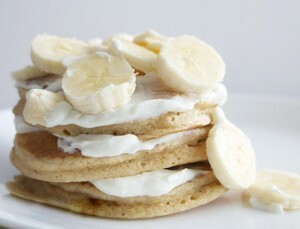 Arrange banana slices on top of pancakes in a single layer (about 8 slices per pancake). Cook in usual fashion. Serve with Banana Cream and Maple Syrup. Combine bananas, apple juice, powdered sugar and lemon juice in medium saucepan over medium heat. Cook until bananas are very soft, about 3 minutes. Using a slotted spoon, transfer bananas to food processor. Add 1/3 cup cooking liquid (discard remaining liquid). Puree until smooth. Chill until cold. Whip the cream and fold into banana puree. Eat and enjoy! Thanks to Fox Hill Bed & Breakfast Suites for this recipe.